Are you looking for ways to help Hospice Huntsville? Find out about how you can help! Hospice Huntsville is responsible to raise 60% of our annual operating budget in order to offer our much needed programs free of charge to our residents and families. Government funding provided annually and partially covers the cost of wages for the nursing and personal support work at the residential hospice. Although this funding is secure, it obviously does not allow the operations of the residential hospice building including heat, hydro, food, laundry and basic office products for charting to continue without the efforts of our fundraising team. There are several options available for donations. By donating monthly to Hospice Huntsville you are helping provide essential end of life programs and services to individuals and families. Hospice Huntsville hosts the 500 Club and the 5000 Club. You can become a member of this well respected club by contributing $500 annually to Hospice Huntsville 500 Club or contributing $5000 annually to the 5000 Club. Your donation is 100% tax deductible as Hospice Huntsville is a not for profit organization. Your annual donation will be a fundamental component to ensure reliable financial sustainability for Hospice Huntsville. Our 500 Club Goal is to secure 500 individuals committed to donating $500 annually. 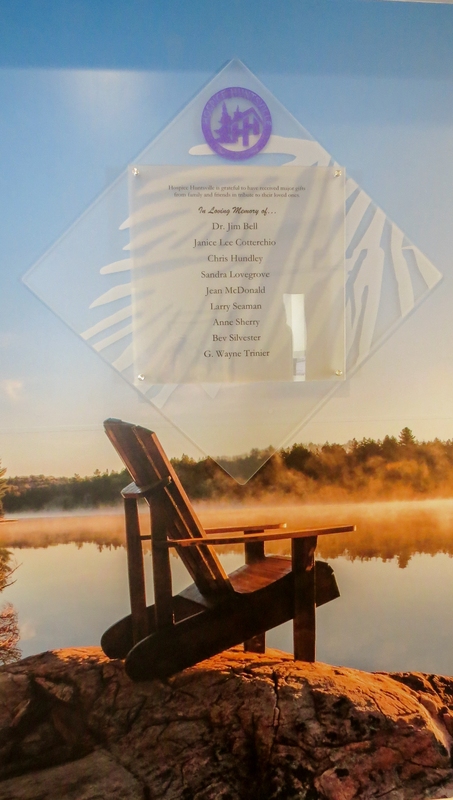 Hospice Huntsville has a new special tribute feature added to the front lobby of Algonquin Grace. An “In Memoriam Donor Wall” has been created to honour loved ones whose family and friends have given generously to our organization. Planned giving allows you to support Hospice Huntsville and its mission to guide the provision of consistent, comprehensive and compassionate end of life care that is readily accessible to individuals, families and caregivers in the setting of their choice throughout the greater Huntsville area. When you donate publicly traded securities to a charity, you pay no capital gains on the accrued gains. You also receive a tax receipt for the full value of the security. Benefits: Life insurance can provide a sizable source of income to Hospice Huntsville at a relatively moderate cost to you. Life insurance can also bring significant tax breaks on the dispersal of your estate and does not have to reduce the size of your estate. For any gift designated in your will, your estate receives a donation receipt that can offset tax otherwise payable by your estate. • Residual Bequests allow you to direct the balance of your estate, or a portion of the balance to be given to HOSPICE HUNTSVILLE after providing for other beneficiaries. • Contingent Bequests allows you to direct HOSPICE HUNTSVILLE to receive all or a portion of your estate in the event of the prior death of other specific beneficiaries. Annuities provide donors who are at least 60 years old with a guaranteed income for life, in exchange for an initial gift to HOSPICE HUNTSVILLE. The income earned by the annuity in your lifetime and the balance of the funds in the annuity upon the dispersal of your estate are received by HOSPICE HUNTSVILLE. • A Charitable Gift Plus Annuity requires a minimum gift of $10,000. Approximately 30% goes to HOSPICE HUNTSVILLE, with the remainder being used to purchase an annuity for you from an insurance provider. A significant part of the annuity cash flow is a tax-free return of capital. The donor also gets an immediate tax credit for the approximately 30% portion of the original deposit that goes to HOSPICE HUNTSVILLE. • With a Charitable Remainder Trust, you give a lump sum of principle from which you receive a net income. You receive a donation receipt for the residual interest in the property transferred to the trust. The Wish List has been created to suit any budget and offers a wide range of giving options- from giving the gift of patient furniture to giving the gift of books for the hospice library. Step 3. Indicate if you would like us to mail you a gift card to the person you are honouring. Your gift card will be mailed along with your income tax receipt. Your gift is 100% tax deductible. You will receive a tax receipt in the mail for donations over $20. Hospice Huntsville works with CanadaHelps, to accept donations electronically using your credit card and their safe and secure website. Giving through CanadaHelps is fast, direct for donors and as easy as 1,2,3. Step 3. Choose fund designation. Step 4. Download your tax receipt. CanadaHelps will then notify Hospice Huntsville of your gift. Each year, Hospice Huntsville reaches out to our donors and the community to ask for support of our Annual Appeal Campaign. 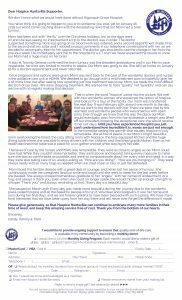 The funds generated by this appeal helps to alleviate the costs involved in operating our residential building Algonquin Grace and the various programs and services that are offered to our residents, their family members and the community. We see the Hike for Hospice and Swim for Hospice events as an opportunity for you to help Hospice Huntsville to continue to provide hospice services at no cost to our community. We invite you to invest in your community in seeking comfort, meaning and dignity for everyone. 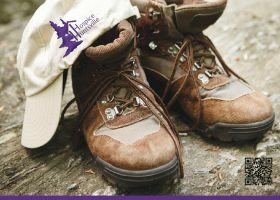 Sponsorship opportunities are available for our 2019 Hike for Hospice Huntsville (May) and 2019 Swim for Hospice (Summer 2019). Hospice Huntsville is very grateful to our donors who have helped us raise much needed funds so we can continue to provide end of life care, services and programs to those who need it most.